Shadow Lord Raggibash Keeper of the Land and Elder Raggibash, Cruel Storm Journeyed from Mexico to help restore the caern, he is an expert at appeasing spirits, other then that he knows as much about the Umbra as any Raggibash Elder. "No I think it's a great idea, yes let's all sit here and wait for the wyrm to fester and grow I am sure if we do nothing it will go away on it's own." 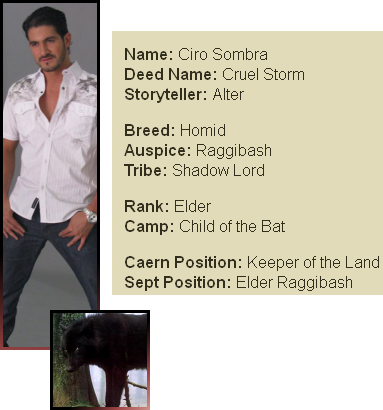 Cruel Storm is a Shadow Lord hailing from Mexico, he and his Pack Specialized in appeasing the angry spirits of Mexico, little is known about Ciro before he came to America, There is a chance even the name on his passport and papers is a fake since the name Ciro means "Lord" and Sombra means "Shadow" it is unlikely he was actually named Lord Shadow by his family. What is known is that Ciro showed up to help re-open the caern and stayed when his pack returned to their territory in Mexico. Cruel Storm puts his ability to appease spirits to use as Keeper of the Land carefully caring for the Caern's grounds, He takes a certain delight in telling those that ask who he is that he is merely the Gardner.